Somalis: A Threat to Kenya? 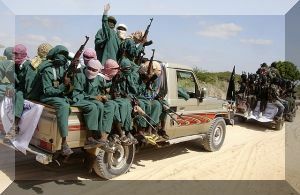 I cannot imagine how some Somali rebels who sneaked into Kenya can proudly display their Al shabaab flag on Kenyan soil. The Government must repatriate them immediately. We know they came through the border and were allowed in by the Administration Police (APs). The Kenya Army must take control of the border immediately.The Army should work hand in hand with the Kenya Police but not the APs. Shocking news allege that 4,000,000 (four million) Somalis have crossed into the Kenyan border and are in Mombasa, Nairobi, Masailand, Kisumu and are sinking deeper into the rural village communities in Kenya within the last one year. This influx was reportedly allowed by the former Somali Police Chief who has a more bigger agenda to turn Kenya into Somali owned country through money coming from pirating as well as other dubious activities. The government must be wary of both the condemned cleric and Somalis who are not only entering Kenya in large numbers but are also buying the Maasais out of the Rift Valley and turning Nairobi into a Somali city. Kajiado town is filled with Somalis. They ought to be probed to find out if they are Al-Qaeda fundamentalists imported to create chaos in Kenya. The Kenya government must beware of a racket that entails the Administration Police (APs) letting into Kenya Somalis through roadblocks (on Dadaab and Garrisa roads) on payment of $300 per person. All the 4,000,000 Somali that crossed the boarder illegally into Kenya must be weeded out of Kenya immediately. Somalis are rising the ladder in senior security positions in the Kenya Police and Army. What do we expect to happen but to open gateways of the runaway kinsmen and to protect their political interests in the Leadership of Kenya from their failed country, Somalia? We are sitting on a powder keg as the government looks the other way. The Government and the Police must act now with urgency before the debate takes a wrong direction. Diaspora Spokesperson and Executive Director, Confederation Council Foundation for Africa Inc., USA.